Nitrogen is the preferred inert gas for these wine-making processes because of its low solubility in wine as well as for its ability to eliminate the presence of oxygen and to prevent oxygen from coming into contact with the wine throughout the many stages of production. The problem of prolonged exposure to oxygen is that it causes oxidation, effectively turning wine into a vinegar-like substance over time. 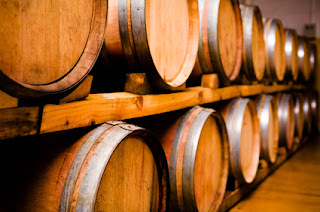 The oxygen reacts with a microbe found in wine and starts converting the ethyl alcohol in the wine into acetic acid - the main component of vinegar! Sparging: this is when Nitrogen (N2) is applied in the form of very fine gas bubbles in order to remove dissolved oxygen from the wine. Blanketing: the process of applying an inert Gas such as Nitrogen into a vessel to displace the oxygen is used during wine-making often to top the head space in partially filled tanks, barrels, or other containers. Flushing: just prior to bottling, air must be flushed from hoses, filter housing pumps, and the fill bowl by using a displacement gas such as Nitrogen. Wine Transfer: when transferring wine from one container to another, Nitrogen should be pumped through the vessels for blanketing and hoses should be flushed to remove oxygen. It may also be necessary to use sparging of the wine at this point to remove any oxygen that has already dissolved in wine. Topping: this is the process of replacing evaporated wine in the barrel. The "head space" in the barrel, also called "ullage," should be flushed with Nitrogen and then blanketed to eliminate oxygen. Bottling: oxidation is a particular risk during wine bottling due to the turbulence and mixing of wine with air in the filling process. It is important to flush wine bottles with Nitrogen prior to and after filling. Nitrogen Generators are an efficient and cost effective way to eliminate the threat of oxidation during wine production and bottling and to preserve the quality of the wine. Nitrogen Generators replace the need for handling high pressure N2 cylinders and expensive gas company contracts. They are safe, reliable, easy to operate, never run out of Nitrogen, and generate Nitrogen as needed so they can accommodate seasonal or fluctuating production schedules. South-Tek Systems designs and manufactures Nitrogen Generators for a wide range of industries including the wine industry. Using our Flow Verification Program, we can accurately measure a client's flow rate in order to match them with the appropriately sized Nitrogen Generator for their specific needs. The tank mounted T-Series Nitrogen Generators are generally used for wine industry applications. These are available in a range of N2 Output levels and are equipped with a 60 gallon tank under 400 lbs. The T-Series Generators are not difficult to place, move, or reposition. Contact South-Tek Systems today to get on your way to a more efficient and reliable Nitrogen system for your winery: 888-524-6284.